Marble serves many purposes that involve using a map. It provides a wide range of tools, which can be useful in various fields of expertise, including education or science and, of course, you can also use it to satisfy your personal curiosity. The application is available for Mac OS X and Windows, it is offered completely free of charge and you can have it up and running in no time. The application presents a map of the world on a 3D-rendered globe. It allows you to rotate the globe and zoom however you want, with a series of direction controls, on the left side of the interface or by simply clicking and dragging. You can find other useful functions, besides the panning controls, in the same region of the interface, on separate tabs. To be more specific, you can find a legend, options for switching between different maps, routing controls and more. Marble places several map types at your disposal and you can switch between them instantly. Besides the standard atlas-type map, you can also find a street map, a satellite view map, an "Earth at night" map, temperature maps and even a historical map. What's more, you can leave Earth behind and travel to the moon if you want to. All you have to do is select the moon in a drop menu, on the Map View tab and the application will replace the 3D-rendered earth with a 3D-rendered moon. It contains various points of interest, like the Apollo 11 landing side. What's more, you may click these points to retrieve additional information and Wikipedia articles. Another useful feature is the possibility of calculating routes. All you have to do is mark your start and end points by right clicking them and selecting the appropriate options. Also, you can choose between fastest or shortest route for a car or routes for a bicycle or pedestrian. The application is capable of calculating a route in one or two seconds, after which it will highlight it on the map. Furthermore, calculated routes can be exported in different formats, for various GPS devices. Marble includes various map types. It gives you full control to pan and zoom, enable and disable specific elements and much more. 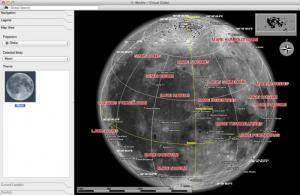 The application provides a map of the moon as well, with link to Wikipedia articles. You may have difficulties calculating a route with the OS X version. With its rich maps selection and its clean and simple functionality, Marble will satisfy all your needs when it comes to maps. You can download Marble free here.